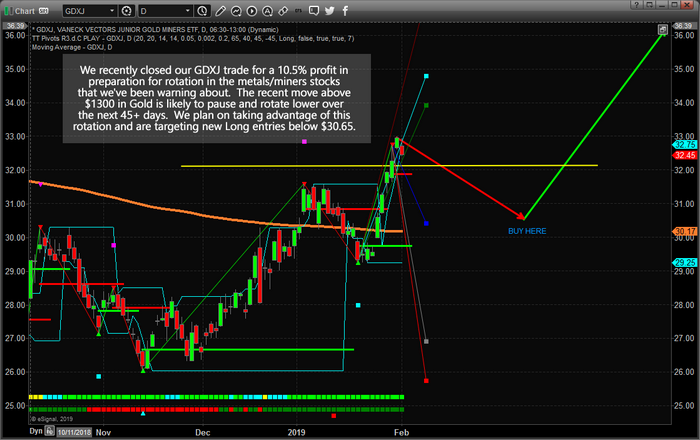 We recently closed our GDXJ trade for a 10.5% total profit with our members. We are preparing for a lower price rotation over the next 45+ days that will allow us to plan for new long. Our research indicates the metals/miners should enter a downside price rotation over the next 45+ days as the US stock markets continue to rally. Give this expectation, it is important to understand how we are timing this move for our members and attempting to take advantage of strategic trade deployment. With Gold recently breaking above $1300, many analysts have been calling for a continued breakout move to the upside as well as a massive market correction in the US stock market. We've been calling for just the opposite to happen – a pause in the metals/miners near this $1300~1320 level. If our analysis is correct, a renewed capital shift will continue to unfold over the next 30~45 days where foreign capital will move into the US stock market (including technology, financial, medical/biotech, blue chips, mid-caps, and others) as global investors chase the safety and returns of the US Dollar and the US stock market. This process of deploying capital into the US stock market will relieve upside pressure in the metals/miners for a brief period of time – resulting in a price pullback. 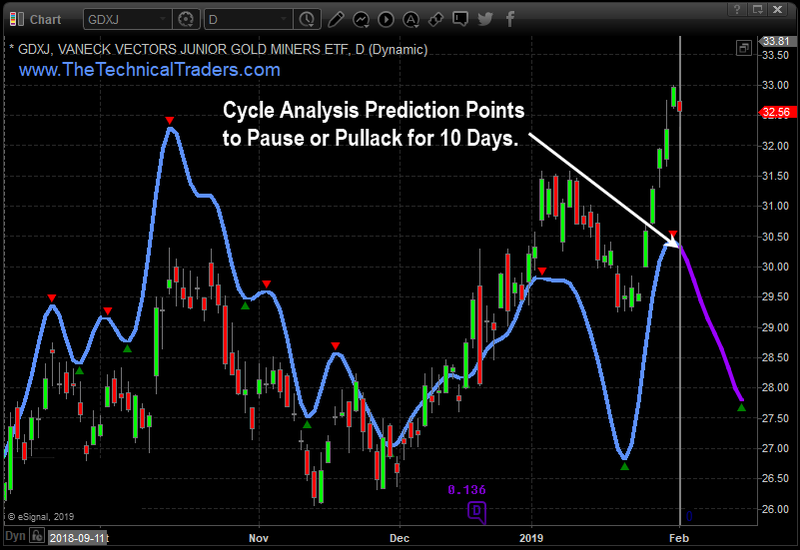 Our expectations are that the GDXJ price will rotate back below $31 and likely target a support level near $30.50~30.65. This is near where we intend to look for new Long entry trades. The opportunity of the next leg higher in the metals/miners is exciting. 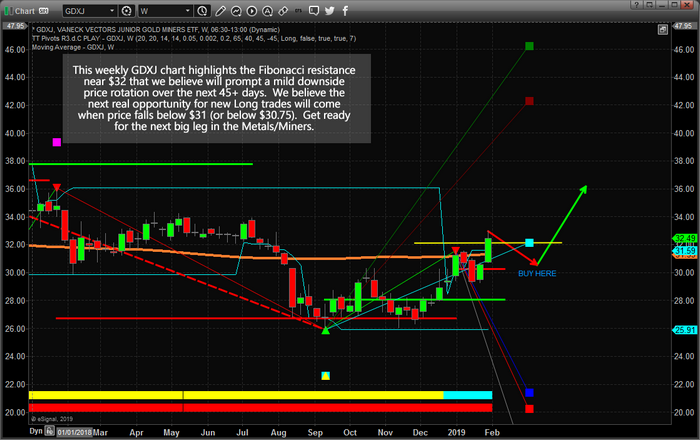 Take a look at this Weekly GDXJ chart showing the upside price targets near $42 and $45. These represent a 37% to 47% upside price objective once this rotation completes as we expect. Through years of research, trading and helping individual traders around the world. He learned that many traders have great trading ideas, but they lack one thing, they struggle to execute trades in a systematic way for consistent results. Chris helps educate traders with a three-hour video course that can change your trading results for the better. His mission is to help his clients boost their trading performance while reducing market exposure and portfolio volatility. He is a regular speaker on HoweStreet.com, and the FinancialSurvivorNetwork radio shows. Chris was also featured on the cover of AmalgaTrader Magazine, and contributes articles to several financial hubs like MoneyShow.com.